Besides changing the color, size and font type, you can highlight text in Excel in several different ways. For example, using: bold (Ctrl + B), italic (Ctrl + I), underline (Ctrl + U), and strikethrough. Many fonts have a few different variations, such as regular, bold and italic. 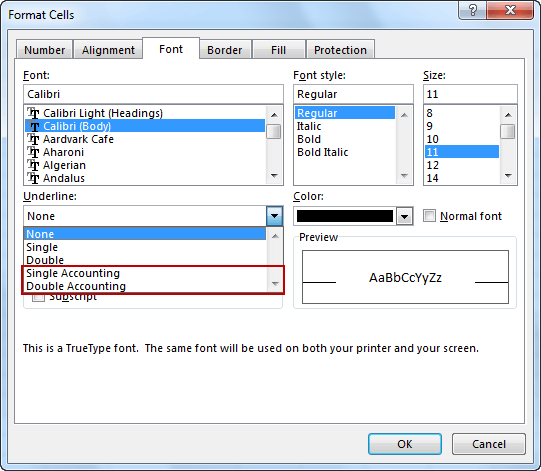 If a font has only a regular type, then Excel creates the other two by using its own algorithm. You can find the bold and italic buttons in HOME >> Font. You can combine them or use them separately. As a result, the text can be written in italics, bold, or bold italics. You will find the underline button on the right side of the bold and italic buttons. When you click the triangle you will have a choice whether you want your text to be Underlined or Double Underlined. In addition to the standard underline, you can also use the Accounting Underline. You won’t find it directly in the ribbon, so you have to click the little square icon in the lower right corner of the font group. You can also use the Ctrl + Shift + F keyboard shortcut. When a new window opens, select from the drop-down list the Single Accounting or Double Accounting underline. In the accounting underline, the whole text is placed above the line. In the standard underline parts of some letters can be under the line. In the accounting underline, the line is stretched across the width of the cell, while in the standard underline the width of the line is equal to the width of the text. 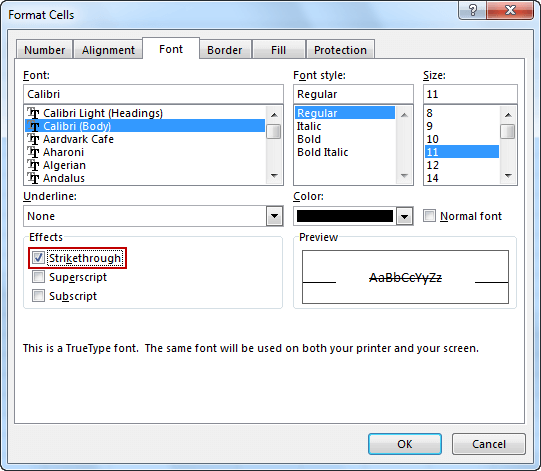 In order to use the strikethrough, select text and use the Ctrl + Shift + F keyboard shortcut. In the Effects area check strikethrough, click OK and see the effect.